FDA owner operator number: 10043842. 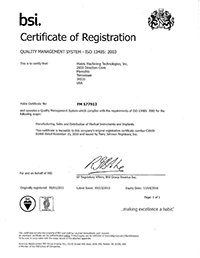 Matrix Machining received its ISO 13485:2016 in November of 2010 and is registered with BSI. Currently Matrix Machining holds cert number FM 577912 with BSI.